We take care of everything. There is no physical involvement or record keeping by you. You sign nothing. We believe in the honesty of employees. It's simple! All we do is place the Snak Pak tray in your location which is convenient for your employees. The tray is then replaced regularly, guaranteeing your freshness. Your employees have a choice of 90 of the finest quality snaks and health foods. Unlike vending machines, they never 'jam' and you always get what you have paid for. ...To continue this service, however. 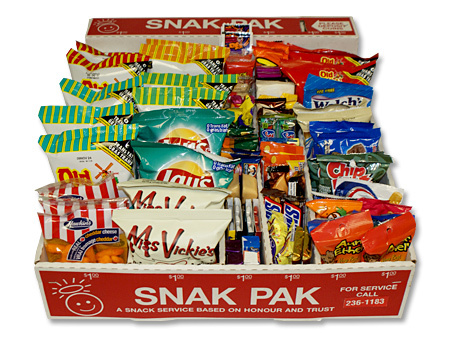 Since payment for snacks is ON THE HONOUR SYSTEM it may be tempting for some to 'borrow' from the Snak Pak. Repeated shortages will result in removal of tray. Please pay for what you take.